Recently an envelope was found on the sticky floor of a hypothetical coffee-house in Toronto, Ontario, Canada, and when opened it was discovered that a letter from actor Kiefer Sutherland was tucked inside. The letter appears to be an apology from the actor to his pals in Hollywood and we have the exclusive contents only right here. The show features Sutherland as a lowly federal government cabinet member who is thrust into the presidency after the entire U.S. Capitol building is blown up during the president’s address to a joint session of Congress. Being chosen to stay away from the capitol as the nation’s designated survivor in case disaster strikes, Thomas Kirkman (Sutherland) suddenly finds his world forever changed. The show follows Kirkman, a political novice and idealist, as he learns the ropes of being president on the job. The show also follows the investigation into those responsible for blowing up the capitol and killing 90% of Congress including the president and vice president, every cabinet member but Kirkman, the whole U.S. Supreme Court, and most of the nation’s Senators and Representatives. The show has sparked some controversy — notably a recent anti-gun episode steeped in liberal claptrap about the Second Amendment — but for the most part it has gotten fairly good ratings and reviews. 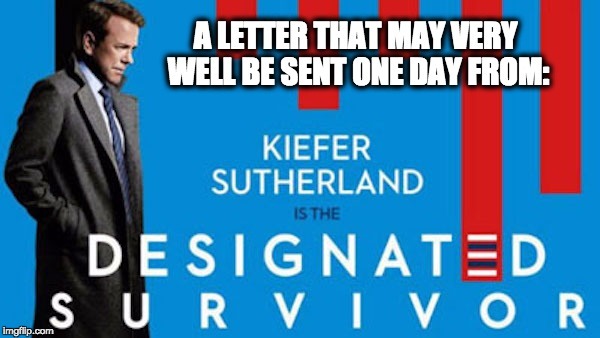 But the show is nothing like actor Sutherland’s last political action show, Fox’s “24,” and therein lies the topic of the lost letter that may very well be written one day–but rather than waiting, we now present it an Opened Letter from Kiefer Sutherland. In my new series, (“Designated Survivor,” ABC, Wednesdays, 9PM eastern) I play a nice wholesome, far left liberal who hates Washington and politics and only ended up in a presidential cabinet position because everyone knew how wonderful and selfless I was. And that I am an extremely liberal, milquetoasty kinda fellow. But, in the show (“Designated Survivor,” ABC, Wednesdays, 9PM eastern) I suddenly become president when the whole U.S. Capitol building is blown up. Yes, like you I feel a bit of glee to be in a show that kills most every politician in Washington, especially the Republicans, and in the very first episode, yet. Now, here is the great part. When I become president I am in a position to do all sorts of wonderful things. Why, I fund a kids music program, I work to undermine that damn gun amendment in the Constitution so that we can begin taking people’s so-called “rights” away, and all sorts of other liberal stuff. Then I get to stare down some ignorant Republicans and even almost send one to jail for defying my liberal ideas. Also, we have made the bad guys a bunch of white people who clam to be patriots. I mean, we all know that every conservative/Republican/”patriot” would love to kill everyone that disagrees with them, right? Islamic terrorism, schmerorism, right? RIGHT?! Oh, yeah, and I even made sure that the Muslim that the bombing was blamed on in the first few episodes is shown to be completely innocent. So, yeah, white “patriots” are the real danger to America, as we all know. I mean, white people, especially men, are an enemy to the whole human race, am I right? So, yeah, in this age o so-called Islamic terror all the evil killers in this show are white people. We all had a good laugh about that in the writer’s room, I’ll tell you what. It’s all great fun, I have to say, but that brings me to the point of this letter to you, my dear, dear Hollywood pals. This new show (“Designated Survivor,” ABC, Wednesdays, 9PM eastern) is my apology for that damned “24.” In that stinker I played a racist killer of innocent Muslims and I really hate it that my name is so connected to that show. Heck, that thing would never even have become a hit that made me millions of dollars if those damn right-wingers didn’t cozy up to it so tightly. I was really hoping that one would last one season and then get forgotten. But, noooo. There it is like a millstone around my neck, ruining my Hollywood credentials. It is a burden I don’t wish on any of you, my dear, dear Hollywood pals. Anyway, I have made sure to be as far left as I can in my new show (“Designated Survivor,” ABC, Wednesdays, 9PM eastern) to make up for the horrible, right-wing things my character was doing in that last abomination. So, please, dear, dear Hollywood friends, watch my new show (“Designated Survivor,” ABC, Wednesdays, 9PM eastern) because it is my apology to you for being so damned Republican in that last one. Warner Todd Huston is a Chicago based freelance writer. He has been writing news, opinion editorials and social criticism since early 2001 and before that wrote articles on U.S. history for several American history magazines. Huston is a featured writer for Andrew Breitbart’s Breitbart News, and he appears on such sites as Constitution.com, CanadaFreePress.com, BizPac Review, and many, many others. Huston has also appeared on Fox News, Fox Business Network, CNN, and many local TV shows as well as numerous talk radio shows throughout the country.